Wedding Photography is an art. Photographing the introduction of the bride and groom for the first time to their family and friends well that ca be challenging. With all of the timeline and preparation we have with our clients, we are sometimes so surprised with the images we create. This perfect moment that I photographed at The Westin Resort & Spa, in Hilton Head, Sc, was so unique and different, I had already photographed 8 groomsmen, and 8 bridesmaids, the parents, introduction, and when the band started to announce the bride and groom, I knew from our prior pre ready photos, that the groom would do something different. I was expecting a funny entrance, or him break dancing, but then my viewfinder found this bride on the groom shoulder, how they got to that point I have no idea, but WOW, that was brilliant, different and I wish I would of had a video camera because the family and friends behind me where so amused and cheering that everyone loved this introduction of the bride and groom at this wedding reception held at ocean front pavilion at the Westin Resort & Spa in Hilton Head, Sc. This image is unique and different, it shows the emotion of the clients, I could not be any happier then the final result of this introduction of the bride and groom wedding image, I had the honor of capturing for my clients. 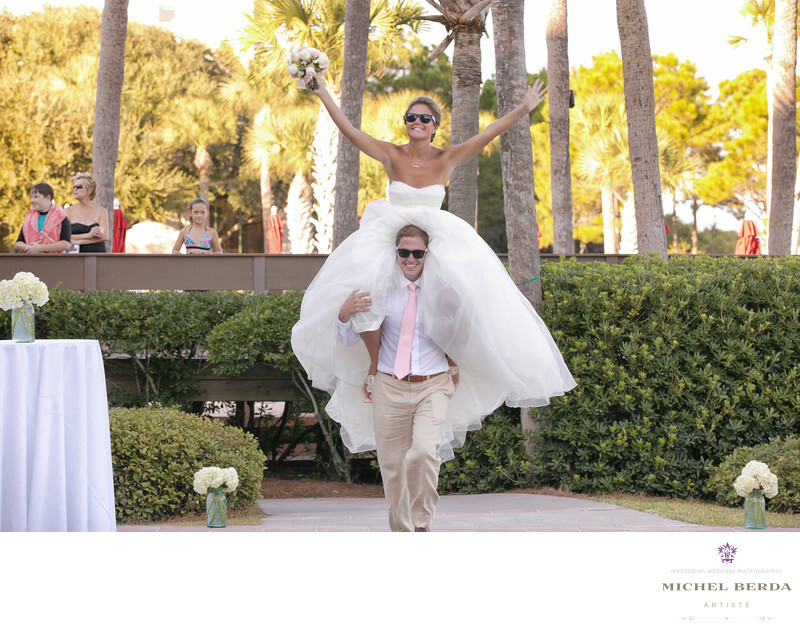 Keywords: Destination Wedding Photographer (117), Hilton Head (75), sc (309), south carolina (24), The Westin Resort & Spa HHI (27), The Westin Resort & Spa in HHI Weddings (27), Wedding photographer In Hilton Head (66), Wedding Photographers (198), Weddings (168).